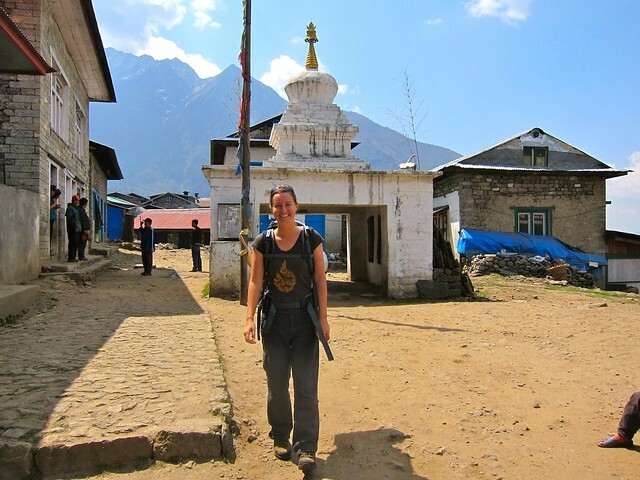 Everest Base Camp trek, Day 1: Kathmandu to Phakding – snackettes. 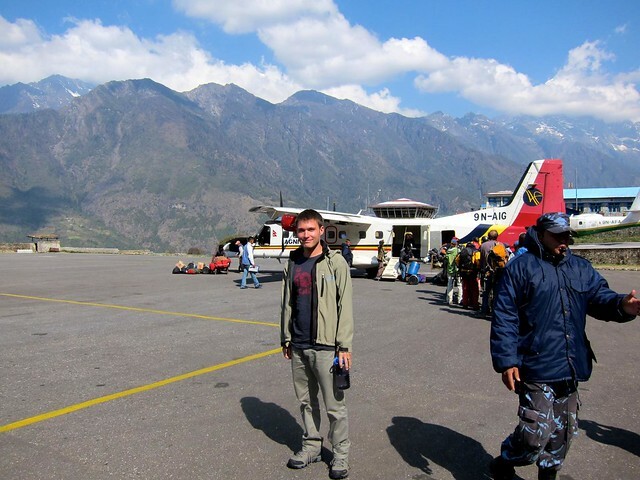 Early on the morning of May 28th, we arrived at the Kathmandu Airport and were put into a queue of people who were all waiting to fly to Lukla, the town where the EBC trailhead begins. Air bookings for domestic flights in Nepal are unlike anywhere else that I know of: having a ticket guarantees you a flight for some time that day (or week) if the weather is good, but it does not assign you to any specific flight, time of departure, or seat. 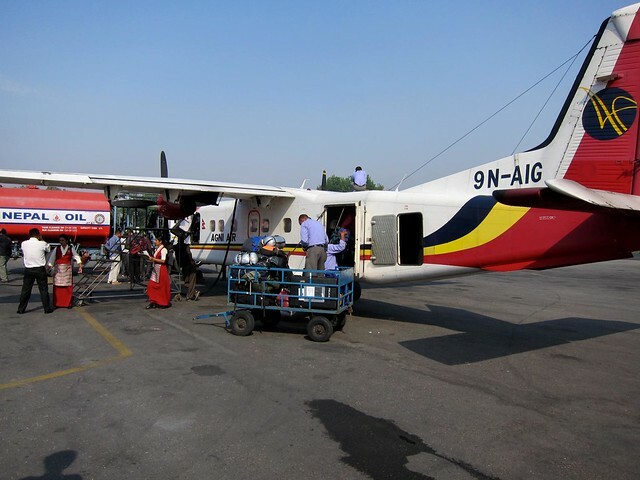 We arrived at the airport and were put on an 8:30am flight with Agni Air. 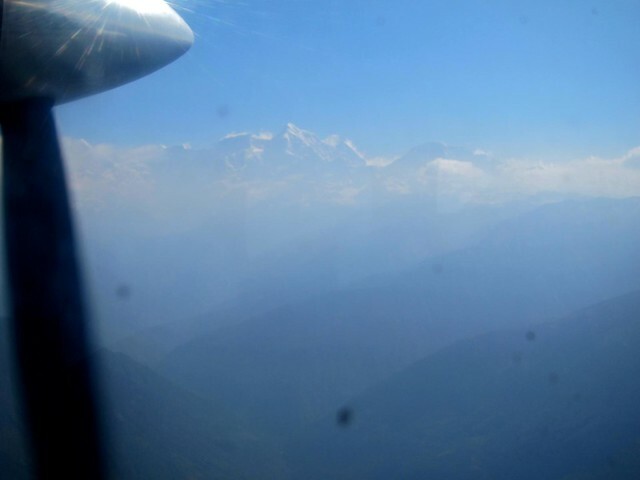 When Scott and I boarded the tiny plane (which only held 10 passengers and 2 pilots), we both scrambled for seats on the left side of the place, since we were told that the left side offers the best views of the Himalayas. Our flight was relatively smooth, but occasionally we’d hit a pocket of air that would send a nervous chatter throughout the cabin. 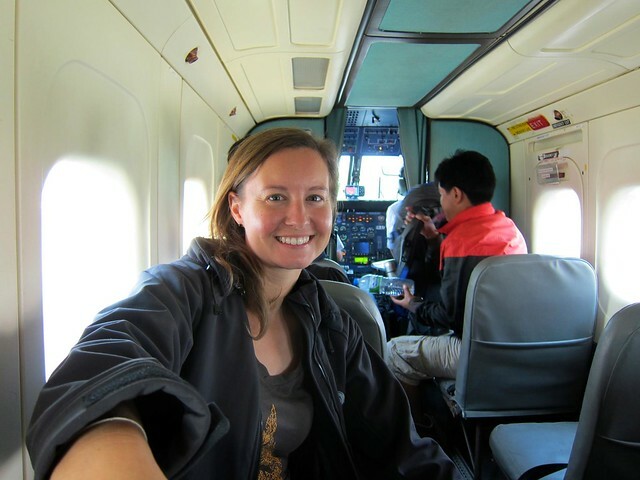 As much as we all tried to let the loud drone of the engines drown out any bad thoughts, everyone was keenly aware that our little plane was battling typical Himalayan wind patterns and flying only hundreds of feet away from some of the tallest mountains in the world. The only thing I could do to distract myself from the flight was to look out at the incredible view in the distance– the Himalaya! 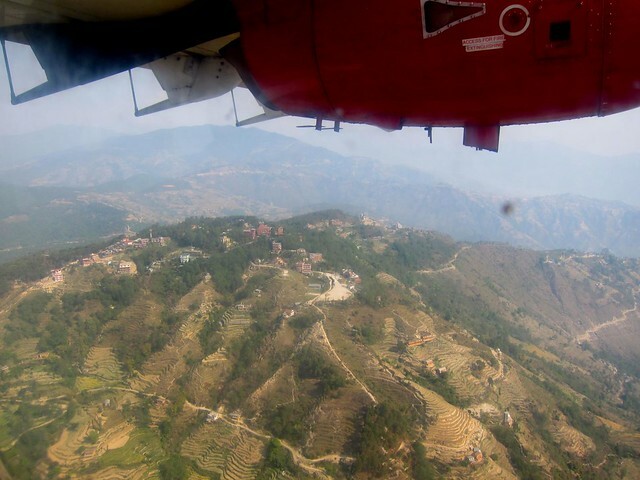 Twenty-five minutes after leaving Kathmandu, we were approaching the landing strip at Lukla Airport, a tiny strip of asphalt at 9,000 feet that begins at the edge of a cliff and ends abruptly at the face of a mountain wall. 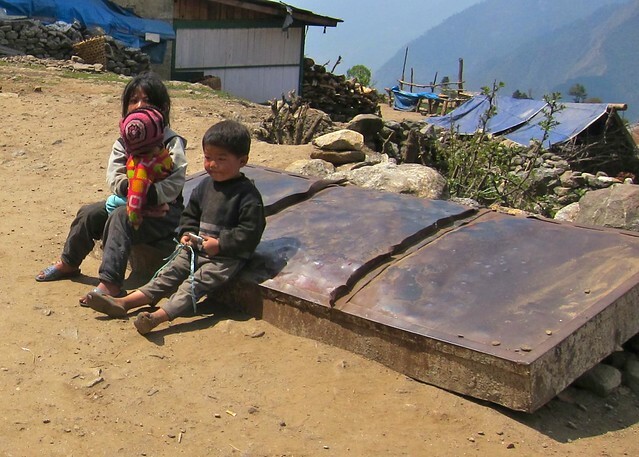 Lukla airport has has the honor of being named the world’s most dangerous airport. And because the landing strip is so short, it was built at a 12 degree angle, both to help landing planes stop more quickly and to help taking off planes gain speed faster before flying off the edge of the cliff. Thankfully, we neither clipped the edge of the cliff on the way in nor ran into the mountain at the end of it; however, I did see one plane that attempted to land and aborted at the last minute and another plane that skidded to a stop right before the face of the mountain, causing the gawking airport staff to run outside to see who the pilot was. Needless to say, I was too nervous to stand around watching other flights come in… We’d be back here in two weeks to fly back out. Scott and I had decided not to use a guide or a porter to carry our bags for our trek to Everest; we wanted the “romantic” adventure of transporting ourselves and our gear from village to village, deciding where we wanted to stop, not worrying about consulting anyone if we wanted to take a detour or add an extra day to rest. So we literally walked off the airstrip in Lukla with our bags on our backs and realized…we didn’t quite know which way to go. Casually trying to play it cool, acting like we were “adjusting” our backpacks, we decided that “left” looked more lively than “right”, and we headed in that direction. A mere 5 steps later, we came to a German bakery, which smelled too good to pass up. 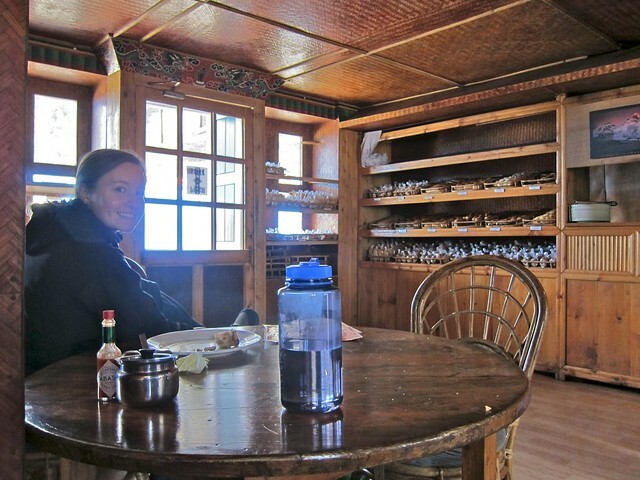 We had heard that European bakeries could be found all along the Everest trail, owing to the large population of European hikers that have been paving their way along this trail for decades, bringing their high-energy strudels and danishes along with them. Solely out of our effort to embrace the local culture wherever we go, we split a seriously decadent, enormous, dense, rich apple strudel for breakfast and then hopped back on the trail. A few hundred feet later, we came to Lukla town (“left” was indeed the right way! 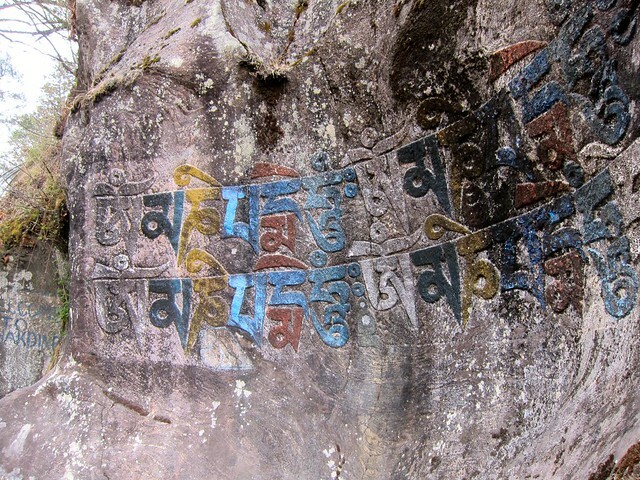 ), where a Nepali policeman stamped our hiking permits. While we waited, we met a guided group of fellow hikers from Zimbabwe. They were shocked to learn that we were hiking the trail on our own. They were clearly concerned for our safety (worried that we would hike too high too fast, I suppose), and we had to convince them that we would be fine. It certainly raised an interesting point though: whereas we thought that independent trekkers would dominate the trail, over the course of our hike we discovered the opposite to be true. Almost all of the other trekkers had guides with them. Not only did we appear to be the only independent trekkers on the trail, we also quickly noticed that very few people around us were carrying their own packs, and we wondered whether it was something we would regret. But in the end, we would be so happy that we had chosen to undertake the adventure on our own. 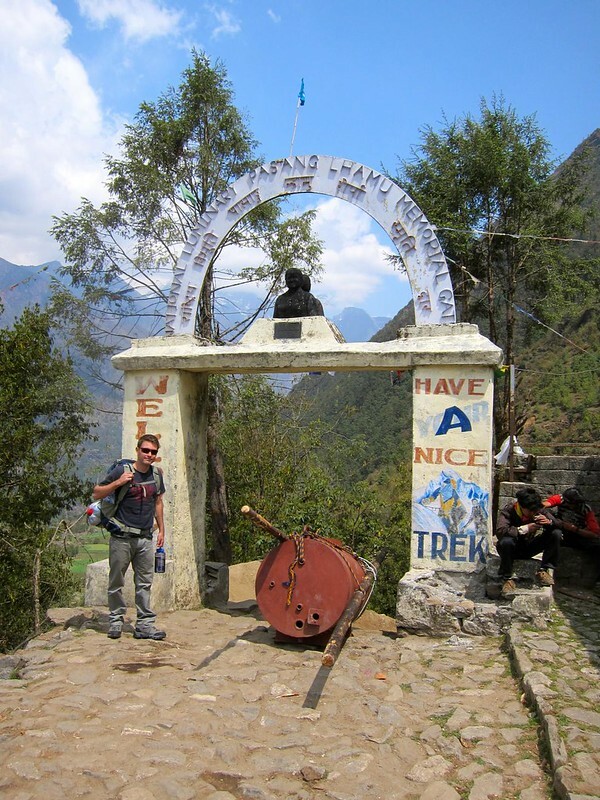 We passed through the welcome gates of the EBC Trek, and just like that, we were off! Our backpacks felt light and comfortable, our new boots weren’t rubbing any blisters, the temperature and humidity were spectacular– we were happy to be hiking out into the big beautiful world of the unknown! A porter’s load is carried on the porter’s back, held in place by a leather head strap that transfers a significant portion of the weight to the porter’s forehead. 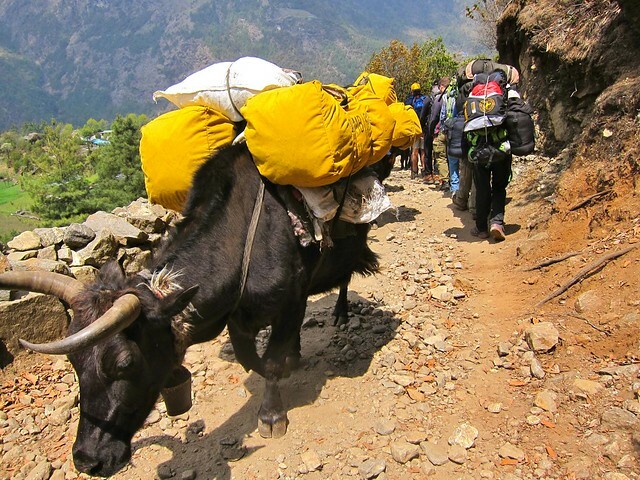 Although one of the best jobs for men in the Khumbu region is to be a trekking guide or camp manager in the Everest region, many young men often end up becoming porters, perhaps because they cannot communicate in a foreign language or because it’s the best job available to them at the time. 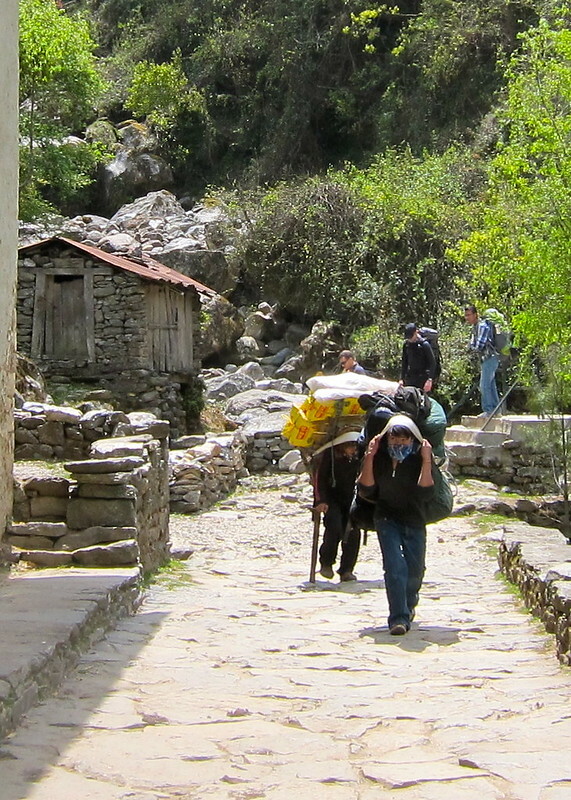 The porters are paid per job based on how much they carry, and we were told that the loads can sometimes exceed 250 pounds (!). 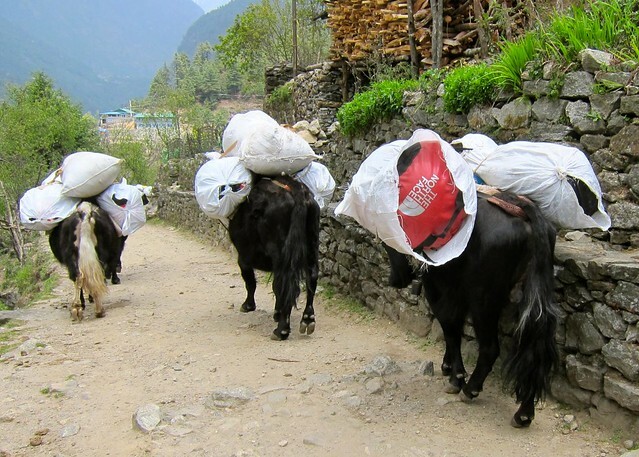 Although porters in Nepal are often mistakenly referred to as “Sherpas,” we learned that Sherpas are a specific ethnic group of Nepali people, and although many of them are porters, the words are not interchangeable. Sherpas are of Tibetan decent, and are the major tribe present in the Everest region. They are the people who have been shuttling people up Everest, running lodges, and supporting the entire tourist industry in the region for decades. 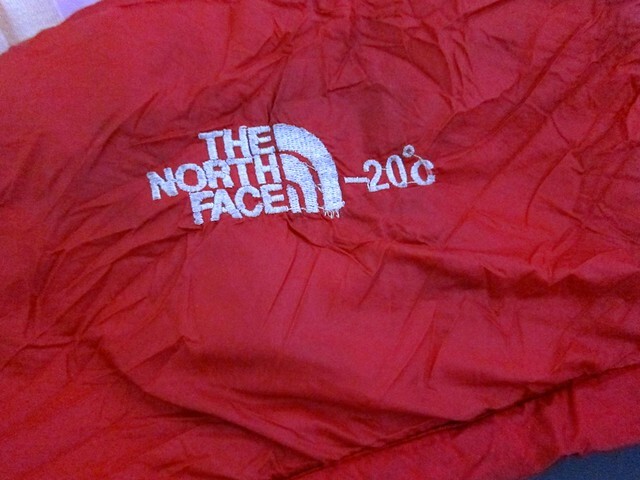 Because the Sherpas have been living at high-altitudes for hundreds (thousands?) 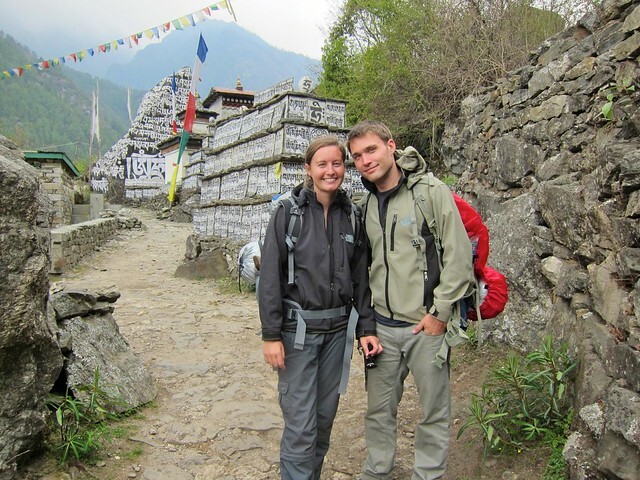 of years, they can function more easily in the low-oxygen environments, making them excellent guides on Everest and, of course, excellent porters. But back to our hike…. 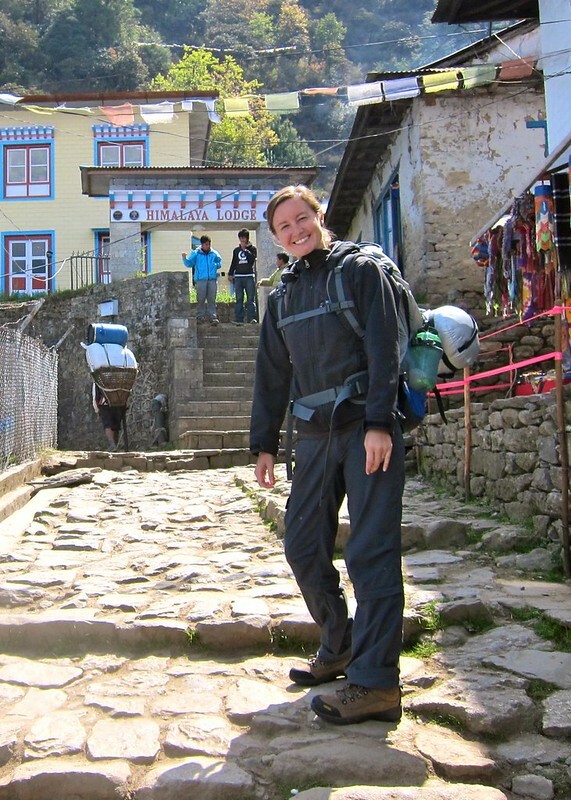 The Everest Trail is largely confined to one in-and-out trail, and I was acutely aware that every step that I took forward was a step that I would have to take back in just a couple of weeks. 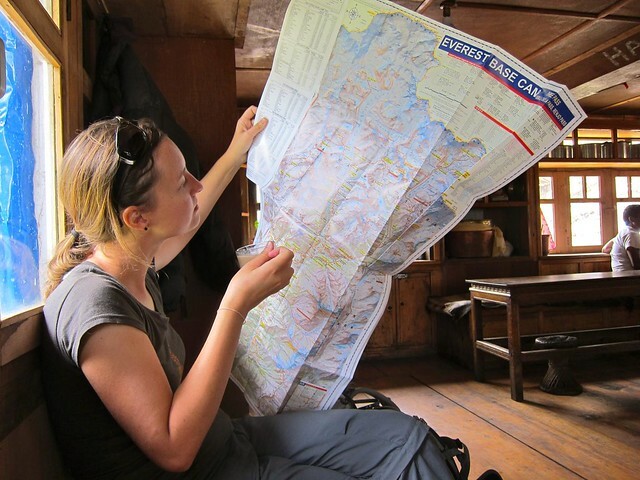 Our first day, we had no definitive plans for how far along the trail we might get, but the “suggested itinerary” for the EBC trek that I had hurriedly scribbled down the day before suggested that we try to make it to a little village called Phakding, about 5 hours walking from Lukla. The trail near Lukla was crowded, and we repeatedly passed the same groups of European hikers, only to have them pass us again if one of us stopped to tie a shoe. 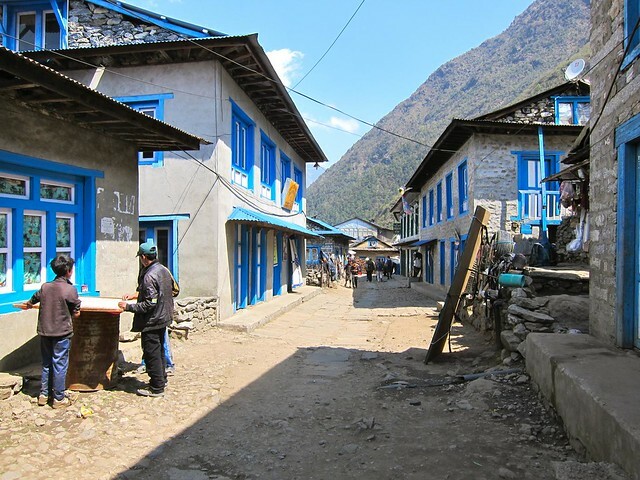 As we walked, I carefully scrutinized each person that we passed going in the opposite direction as us, back toward Lukla: Had they made it all the way to Basecamp? What had they been thinking when they were in my position two weeks ago? Some people were jovial and in good condition; other people limped on one leg or leaned on their walking sticks a bit too heavily. One young woman asked her guide if she could walk around the measly little set of rock steps that lay in front of her, rather than go over them and punish her knees any more than she had already. But our week of hiking in the high-altitude hills in Chopta was paying off, as I kept mentioning how surprised I was that climbing steep stairs with a fully loaded backpack felt so easy. Once we had warmed up, we were flying past the other groups on the trail, barely stopping to catch our breath. 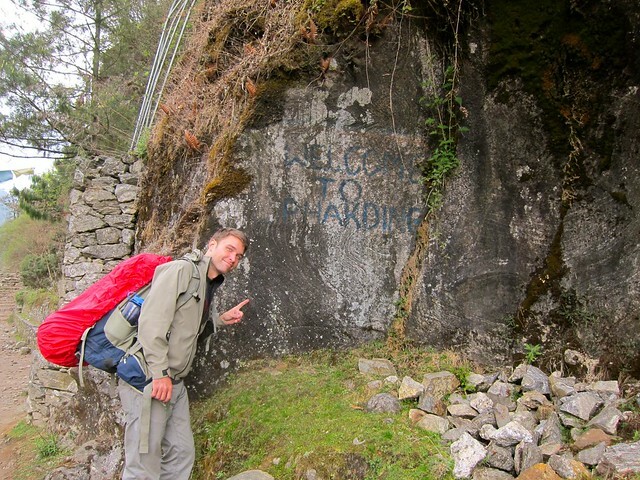 We paid for our teas and continued on to Phakding, passing though tiny villages every half mile or so. Along the way, we stopped for lunch at another tea shop, which offered beautiful views over the green forest while blocking the equally ferocious winds that encouraged us to sit inside. We reached Phakding around 2:00 in the afternoon. Despite the 5-hour walk we’d just completed, we felt oddly energized and decided to push past Phakding to get a head-start on the hoards of backpackers that we would find ourselves alongside the following morning. 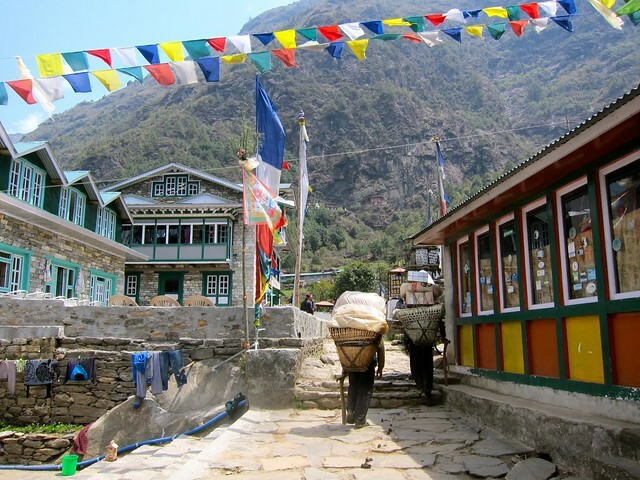 We hiked through the village and got our first taste of what the lodges and towns along the Everest Trail would be like. Dozens of lodges reminiscent of old Swiss hiking lodges lined the road of the tiny, single-road village. A few shops sold the items that people might have forgotten to buy in Kathmandu (socks, bandages, beanies, walking poles, maps..….) at exorbitant prices. Because we had no knowledge of what lodging prices were like along the trail, we began asking lodge owners what their prices were when we arrived into town. 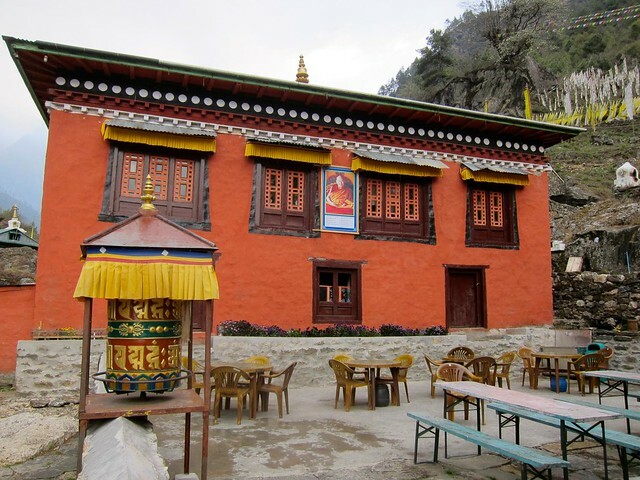 We were relieved when we asked the first lodge owner for the price of a double room: 100 rupees…about $2. Just out of town, we found a nice stone lodge that we decided to sleep in for the night. 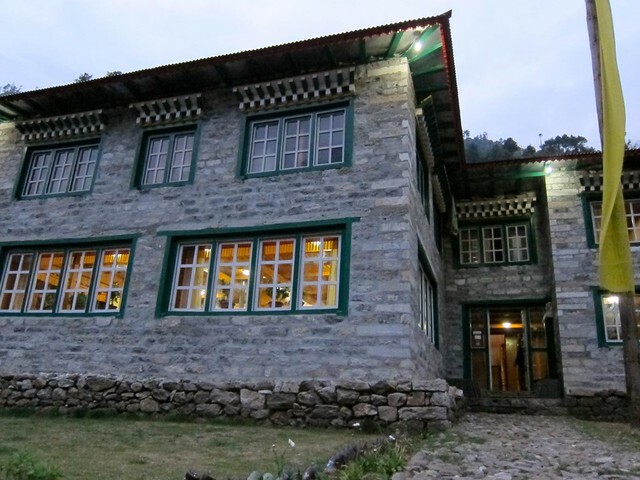 The lodge was on a lush green, mountainous outcrop overlooking Phakding. It was well-maintained by the 3 young guys who lived and worked there during the high-season, with a wood paneled common room and two floors of basic hotel rooms. Tonight, we would be the only guests. Although we had been spoiled by hot showers and free use of the electricity in Kathmandu, the case was certainly going to be different on the Everest trail. Our room was clean but basic, with nothing but two twin beds and a window. The only electric outlet on the second floor of the hotel was located outside the one shared bathroom, with a sign over it that read “Outlet use: 100 rupees per hour”. Luckily, we had charged our camera in Kathmandu. When I asked the guys if I could take a hot shower, they winced a little and told me to wait until they turned the boiler on around 4pm. I patiently waited until 4, when they turned on the water and stood outside the bathroom to make sure it was working properly for me. It was, but to call it a “shower” is a little misleading. It was a faucet at knee level that I used to gather water in my hands and throw it onto myself. 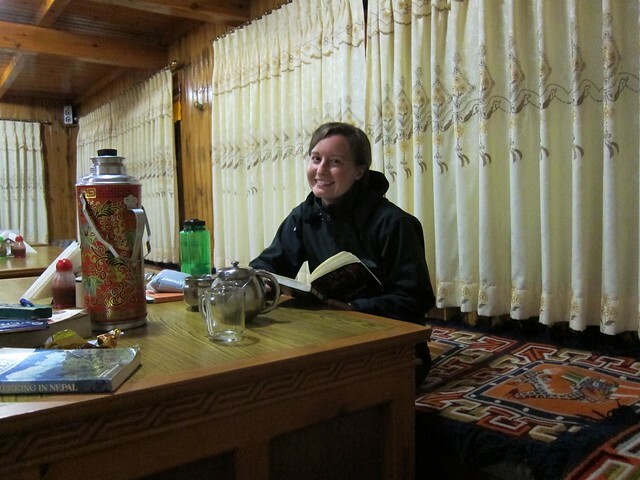 Mind you, the hotel itself (or any hotel on the trail) was not heated, and I was “showering/ throwing water at myself” in a 50-degree tiled room. It was freezing. 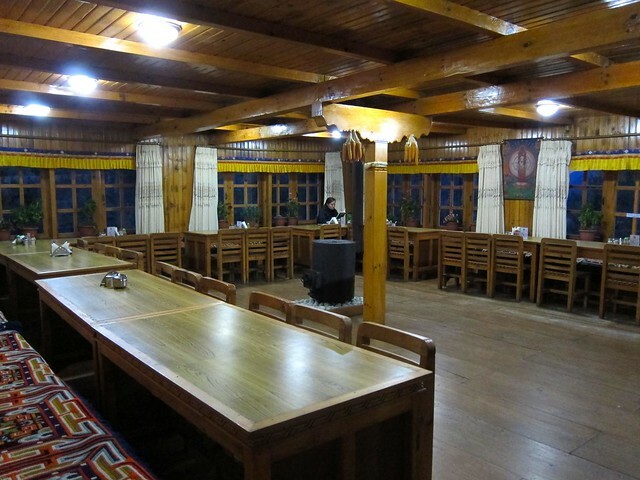 I eventually rejoined Scott in the common room (he declined a shower), where we had vegetable momos (dumplings) for dinner and spent a while talking to the young hotel manager. 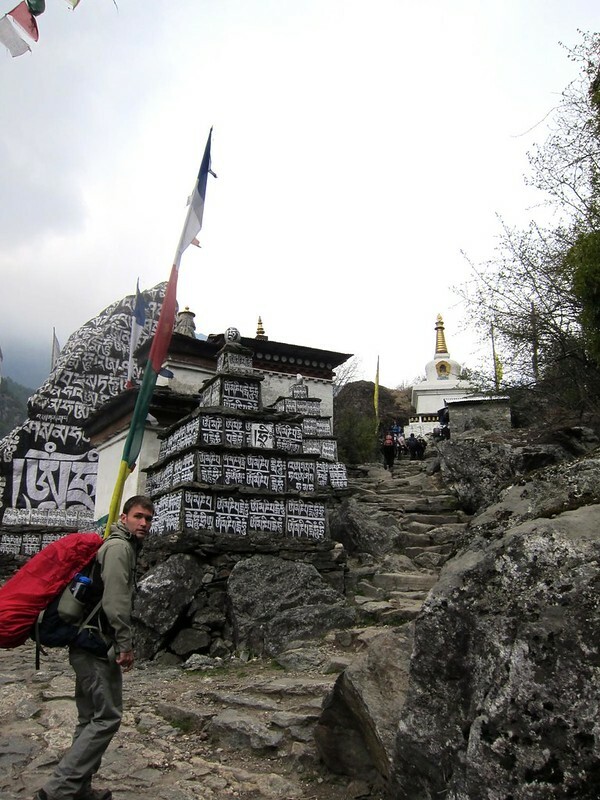 He was raised in the Khumbu region and had been to EBC many times. He was obviously proud to be from the area, and he happily told us about what lay ahead on the trail and where we could get our earliest view of Everest. He had aspirations of eventually reaching the summit of Everest one day, and we were suddenly so revived to be on the trail– we’re really here! People here climb Mt. Everest! This guy was going to climb Everest one day, too! Wow!! Wisely, his plan was to train to be a mountain guide and get paid to summit the mountain, rather than paying to hike it, as most tourists do. He gave us a book to take up the trail with us (we decided to leave it with him and leave the extra weight out of our bags in the end). 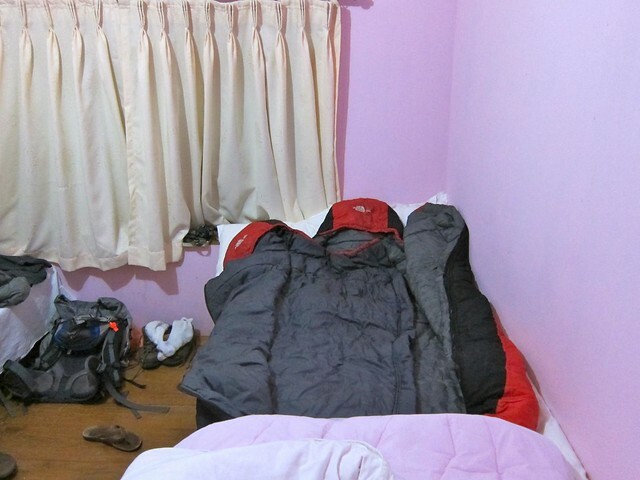 After talking with him for what must have been an hour, we finally decided to turn in to our sleeping bags in our [very unheated] room and get some sleep…. Hi, I’m sorry I don’t know the name of the lodge! There are many similar ones to choose from when you arrive there, though. Our lodge in Phakding was just over the bridge heading out of Phakding– once over the bridge, you take a left at the fork in the road, and the lodge is just a hundred yards ahead. Wish I could be more help!